Six years on, and the horror of that day has not diminished. I remember that day very well. When I woke up that Tuesday morning in 2001, I turned on the radio and there was a live coverage about the twin towers having been hit by two planes. I quickly turned on the TV and I was so shocked that all I could do was sit on my bed and watched the horror unfold on TV. The collapse of the two towers was all there on TV and I watched it live. It was unbelievable. It was a black day indeed. I will never ever forget that day. I will never ever forget the enemy who perpetrated that horror. Hello Puteri, glad to read your dad is doing well. Ahh, you from Sarawak. I used to go over there on business, KK, Kuching, Sibu, Miri and a few other smaller towns. Before I continue...re h/phones, my wife and I don't own one, as mentioned we both not phone talkers. At the malls when I want to find her, I do a magpie bird whistle. She can hear it and knows its me and knows where to find me or I her. We carry coins incase we need to make a call. Then use a callbox. One month maybe spend only 25 cents, ha ha. Back to Sarawak, in the late 70's I knew the grandson of a long house chief (will not disclose location here or names), as I gave him a job. As I was interested in seeing a long house where no tourists go or away from civilisation, he took me to his longhouse. By Landrover 4 hours thru jungle and logging roads, then upriver 3 hours to an isolated long house. He had already sent word ahead he bringing his "big boss", ha ha, so I received quite a welcome party from his grandfather and all. Supposed to stay 3 nights, but due heavy rains, river impassable, stayed 5 nights. I had brought couple of bottles of Brandy, several cartons of cigarettes, biscuits, soap, salt, sugar for the kids and women. And for the Chief, a Swiss army knife which he really loved. At night I had tuak to drink till my head saw stars! As well rice cooked in bamboo, and delicious wild boar meat. But I took a pass at monkey or something which I did not recognise. They sure knew how to entertain and their hospitality can put my relatives to shame. They sure know how to party! And the ladies? Holy Smoke! They were, ahemmm, real exotic beauties. Oh ya, I received from the chief, ahemm, cough, cough, a big packet of 'Tongkat Ali, and 'kacip Fatima'...all specially concocted by his, the chief's secret additions of jungle herbs or whatever. I still have several pics of our trip there. It was fun following them hunting, digging up tapioca, and bathing in the clear river (or ahemm, watching the ladies, ha ha). Oh ya, one time I was travelling late evening in a very small boat and trying to wash my hands in the river when the boatman told me not to as there were crocodiles. You should have seen how fast I snatched back my hands from the dark waters, ha ha. ps, might do a posting of my above adventures one day. That is some story at the longhouse. You MUST write about that experience soon! I can't wait for it .. already the teaser is whetting my appetite! About the cell phone, it is not a necessary accessory. I know people who are slaves to the thing! You must be a pretty good whistler for your wife to be able to hear you at the mall! Heheh. I hope to hear more details of Mr. Lee's visit to the longhouse also! The longhouse where we celebrated Gawai Dayak (birthplace of Puteri's parents) was VERY hospitable. Back to the original subject of the blog entry, Puteri, you know that I, of all people, will NEVER forget what was done to us, all the peoples of the free world, 6 years ago. Me too me too, want to hear details of Uncle Lee's visit to long house. 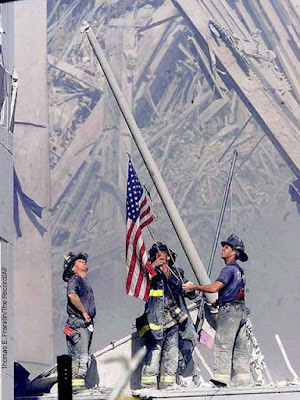 Yes, we must never forget, especially the heros' of New York and the courage of the people of USA.